Give it your best shot! 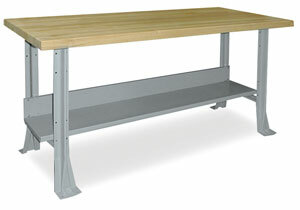 We bet you can't destroy the Hann Steel Workbench with Maple Top, no matter how hard you try. 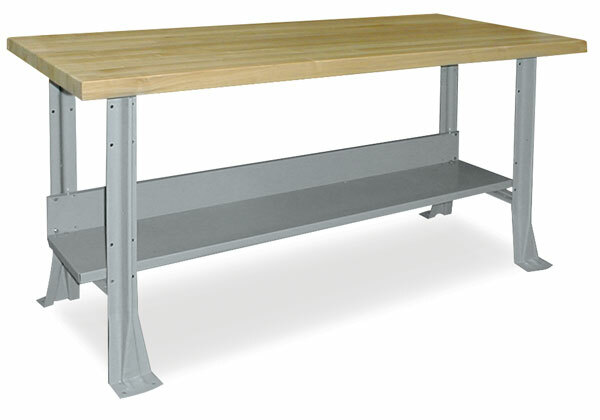 This workbench features a welded, heavy-gauge steel frame an all-steel utility shelf. Both have a durable, chip-resistant Gray finish. Stringers add rigidity while eliminating sway, and the feet have pre-drilled holes so you can mount it to the floor. The laminated 1¾" thick hardwood top is made of the finest kiln-dried, air-seasoned maple, and its smooth natural finish is achieved through multiple coats of hot lacquer. The top surface spans across the legs and overhangs by 1½" on each side.